This book is brilliant on many, many levels. We’re told the author Claire North is a pseudonym for a “prominent British author”. I believe it. The author’s impeccable, artistic-level of writing is top of the line. The research—oh my God, the research—this author nailed not only the historical context throughout the 20th century, but did so by identification with the cultural accuracy in England, Russia, China, and the United States. Furthermore, each locale and time period reflected the proper dialect, scientific discovery, and emotional awareness of its time. Wrap this up with a cleverly woven story wrapped in a unique setting of time repetition. Brilliant. Protagonist Harry August is what the book calls a Kalachakra or an Ouroboran. The word Ouroboran references an ancient Greek symbol of a serpent eating its own tail, re-creating itself. See where this is going? The Kalachakra is taken from Tibetan Buddhism, referencing a time-wheel. In other words, when Harry August dies (usually around 1990) he comes back in his own baby-body in 1919. He has to re-live his life. The first few lives are exploratory with madness (suicide), expression (asylum), and finding (God and the universe). August is also a Mnemonic, meaning he can remember everything from previous lives. He uses this to become a doctor in one life, a professor in another, a philosopher, a physicist, etc. The author does an excellent job of making this increasing level of awareness and intelligence a believable concept. August is not alone. From the book, people like August are born “one in every half million of the population”. These people find each other and assemble a group called the Cronus Club, a society of members vowing not to alter history. Through the club, members can send messages back in time through the various generations of members. Members not in compliance are dealt with in one of two ways: an electrical clearing of the mind, or a pre-birth termination. Such drastic actions are necessary in cases of cataclysm caused by careless members. When steamships start sailing in the 1600s and cultural revolutions happen all at once, it is a problem. A world-ending problem. That’s where things really kick-off. Around the eleventh life, Harry finds out from a seven-year-old Kalachakra that the world is ending. Through prior-life connections and his perfect memory, it is up to Harry to use espionage, subterfuge, and anything it takes to save the future world and the lives of his fellow life-repeaters. 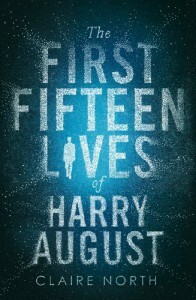 Chapters flip among the various lives of Harry August, building up the connections he’s made each life, ultimately building to the book’s exciting climax. The complexity involved is mind-numbingly amazing, and even as widely woven this story is, it is captivating and easy to follow throughout. Once the author of this book is revealed, it will take-off. Consider me a member of the future, telling you to read it now. Thanks to Redhook and Orbit for providing me with an electronic review copy of this book. It was a pleasure to read and review.